One of the best explanations I’ve heard is that bitters are like spices for cocktails. You would never cook certain dishes without spices and the same is true of some cocktails and their bitters. Old timers only considered drinks with bitters to be true cocktails. The quote on our Mission page sums it up nicely. A cocktail is “a stimulating liquor composed of spirits of any kind, sugar, water, and bitters.” This week’s cocktail is an excellent example of how bitters can elevate a cocktail from mediocre to wonderful. If you don’t believe me, try a Manhattan without bitters some time. But, what exactly are bitters? The page on Wikipedia gives a great definition. “A bitters is an alcoholic beverage prepared with herbs and citrus dissolved in alcohol or glycerine and having a bitter or bittersweet flavor. There are numerous brands of bitters, which were formerly marketed as patent medicines but are now drunk as digestifs.” That page also gives a list of current and past bitters, although it’s not complete. 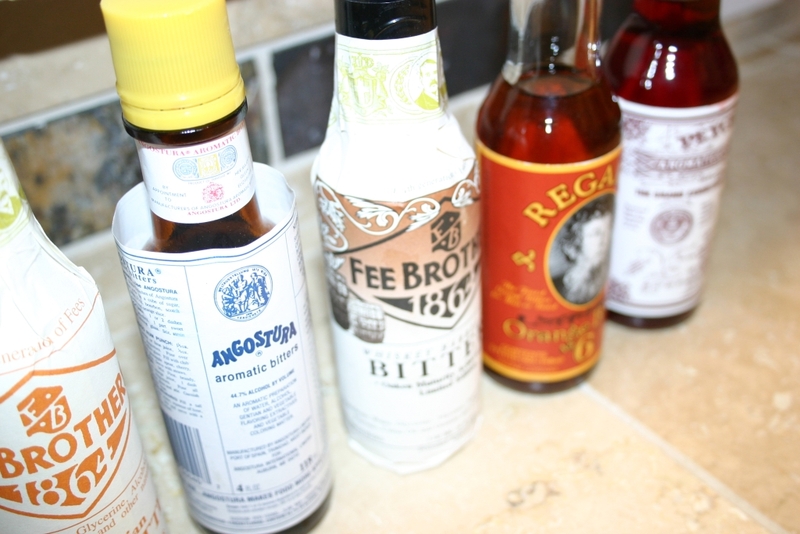 Another good reference with a lot of bitters history is Robert “Drinkboy” Hess’ page on the subject. Finally a great discussion of all things bitters is the 12 page forum thread on eGullet. There are also some great pictures of older bitters. At this point I should mention that bitters basically last indefinitely so if you encounter an old bottle don’t immediately toss it. Give it a taste, you might be pleasantly surprised. As for what you should have in your cocktail bar I think three types are essential: Angostura, Peychaud’s and some form of Orange Bitters (Fee Brothers and Regan’s are both great). Angostura bitters have a nice cinnamony sort of flavor and Peychaud’s have a stronger licorice note. A good way to introduce yourself to the flavors is to add a few dashes of bitters to a small amount of water (sparkling or still) and sample. This will mellow the bitterness and allow the other flavors to come through. Bitters are becoming very widely available in liquors stores all over. But, if you can’t find a specific brand you’d like to try turn to the internet, for it solves all problems. Kegworks carries a huge selection of bitters and other cocktail tools. Some bitters brands to try if you’re interested in branching out are Fee Brothers and The Bitter Truth. A final option is to make your own bitters. We’ll be covering this in depth in a later post as I’m very excited about making my own ingredients.